A GEF-funded, FAO-implemented project is improving the cocoa supply chain in Ecuador's Napo region, an area famous for its traditional agricultural production methods. When you bite into your next gourmet chocolate bar, take a second look at the packet to see its ingredients. Chances are that the Cocoa came from the Amazon of Ecuador. And if you are very lucky, you may have been consuming the fine aroma cocoa from the Napo region of Ecuador without even knowing it. Ecuador’s Amazon has long piqued global interests for its high biological diversity. For the people of Ecuador, this biological diversity translates into livelihoods, food and medicine. Therefore, sustainable use of natural resources is essential for this country. The province of Napo, located in the central area of Ecuador, stands out for its traditional approaches, where the local family farmers have been using the Chakra system for sustainable production of fine aroma cocoa in approximately 1,200 hectares of forest area. The Chakra is a traditional agroforestry system that maintains high agrobiodiversity in an agroecological manner. Over 65 species of flora, including the cocoa, are ecologically managed in the system to grow products for self-consumption and commercial use. The Chakra system is managed primarily by the Kichwa women known as the Chakramamas, who hold the wisdom of the Chakra cycle and use of crops and associated plants. This ancient knowledge has been passed on for generations from the indigenous communities and helps the cocoa retain its biophysical and cultural benefits. FAO’s Global Environment Facility (GEF)-funded project in the Napo region has been working towards strengthening the cocoa value chain to support local livelihoods dependent on the crop. To make the most of the limited but valuable production of cocoa, the Kichwa indigenous community of Napo have developed various partnerships with the private sector. The cocoa is exported in great volumes and takes form of gourmet chocolate bars, fine cocoa powder, and liquor. These partnerships are directly benefitting the 1,150 farmer families of Napo that are involved in the production, processing, and marketing processes. Today, the provincial export volume averages to 120 tons of cocoa beans per year, giving greater market access and commercialization benefits to the family farmers of Napo. 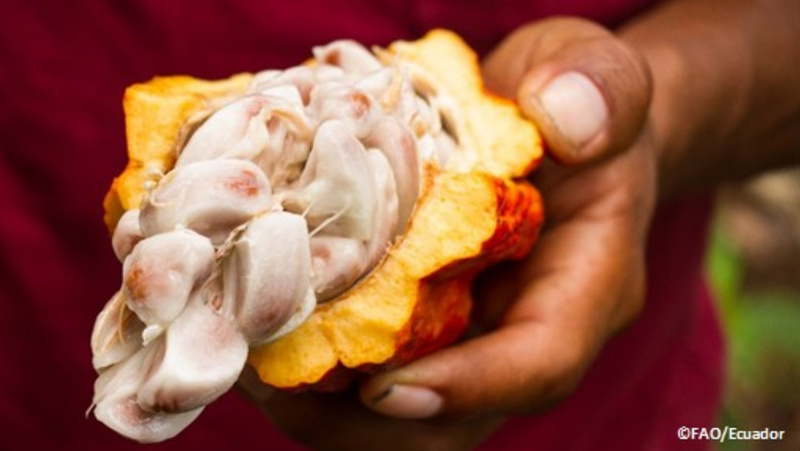 Over 65 species of fauna, including cocoa, are ecologically managed in Ecuador's Chakra system to grow products for self-consumption and commercial use. The project "Conservation and sustainable use of biodiversity, forests, soil and water to achieve the Good Living (Sumak Kawsay) in Napo" is an initiative implemented by the Napo Provincial Government, the Ministry of Environment, the Ministry of Agriculture and Livestock of Ecuador, with technical assistance from FAO and financing from the Global Environment Facility. The project aims to improve the supply of goods and services from agriculture, livestock, and forestry in a sustainable manner through the strategic intervention of public resources, participatory environmental governance and implementation of incentives and a bio-commerce strategy. The sustainable agroforestry approaches supported by the project, like the Chakra system, led to 11,000 tons of CO2 equivalent carbon sequestration by 2017, which contributed to the improvement of the resilience of local production systems against climate change. The project has also supported introduction of various policies and programs that have had a positive impact on reducing the deforestation rate in the region, from 2,735 deforested ha per year to a current rate of 2,308 hectares per year. FAO and the Global Environment Facility have developed their relationship over more than two decades. The FAO-GEF partnership has helped deliver more than 180 projects in over 120 countries across continents. These projects have benefitted more than 4.6 million women and men, created over 350,000 jobs in rural communities, safeguarded biodiversity in 189 vulnerable marine ecosystems, and saved close to a thousand crop varieties and animal species and breeds from extinction. Importantly, in 90 of these projects, indigenous peoples and local communities have been actively involved in project design and implementation. The ,,[ was established on the eve of the 1992 Rio Earth Summit to help tackle our planet’s most pressing environmental problems. Since then, the GEF has provided over US$ 17.9 billion in grants and mobilized an additional US$ 93.2 billion in co-financing for more than 4500 projects in 170 countries. Today, the GEF is an international partnership of 183 countries, international institutions, civil society organizations and the private sector that addresses global environmental issues.